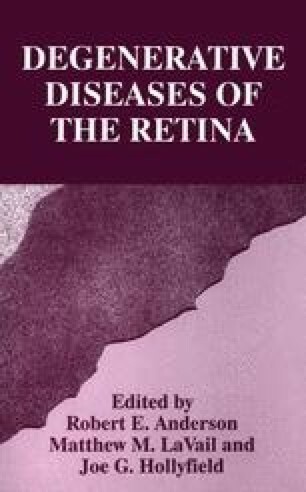 Apoptotic cell death is observed in acute retinal lesions in the albino rat induced by relatively low light levels and short exposure durations (1000 lux and 3000 lux diffuse, white fluorescent light for 2 h). At higher illuminances and extended post — exposure intervals, necrotic cell death is prominent. In our model, the threshold for apoptosis is at 1000 lux for 2 hrs. Distinct morphological signs of apoptosis with chromatin — and cytoplasmic condensation in rod photoreceptors appear within 60 minutes after the onset of light exposure and increase thereafter. 24 hours after exposure, presumed apoptotic bodies, cellular debris and necroses prevail. In situ DNA end labeling reveals DNA breaks in rod nuclei. Agarose gel electrophoresis after DNA extraction from light exposed retinae shows the “ladder” formed by DNA fragments of nucleosomal size (180 to 200 bp or multiples). In the pigment epithelium, apoptosis is seen 24 h after the light exposure. Potential mediators of apoptosis may include arachidonic acid and some of its metabolites which are evoked by light exposure and induce apoptosis in other cells.